Montage Mountain Ski Resort is conveniently located in Northeast Pennsylvania’s scenic Pocono Mountain Region "The Poconos." The 140 acre resort, just outside Scranton, PA doubles as a skier’s paradise by winter and waterpark by summer. 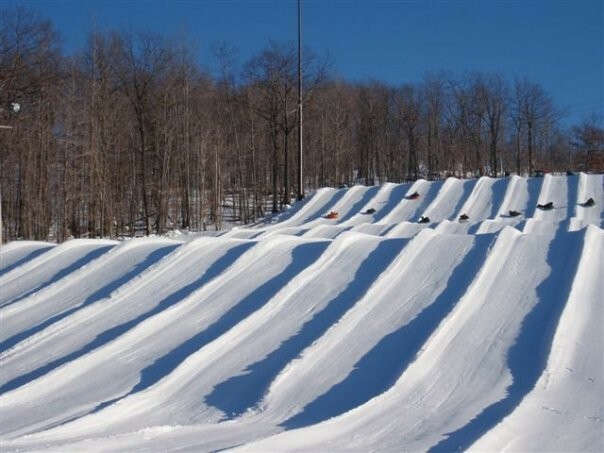 The Ski Resort features 26 slopes, groomed terrain, 100% snowmaking, 100% night skiing, the fastest snow tubing lanes in PA, 1 terrain park, 7 lifts, and is 1 of 7 ski resorts in the country, the only in Pennsylvania, to offer Airboarding! With terrain ranging in difficulty from beginner to expert, including the 2nd steepest slope on the east coast, “White Lightning,” Montage Mountain is a must-visit destination. Ski accessory shop, ski and snowboard rentals, and lessons along with a hospital 10 minutes away. 100 percent snowmaking.